Click here to read about Admiral Cervera aboard the GLOUCESTER following the battle. The Gunboat U.S.S. GLOUCESTER was originally J. P. Morgan's yacht CORSAIR. Commanded by Lt. Commander Richard Wainwright, the former Executive Officer of USS MAINE, GLOUCESTER proved her value in the Battle of Santiago by attacking the much faster and more powerful Spanish Torpedo Boat Destroyer FUROR, greatly assisting in her destruction. At the outbreak of the war, the US Navy quickly purchaced a number of vessels to round out the fleet. On April 23, 1898 J. Pierpont Morgan's yacht CORSAIR was obtained for $225,000. She was renamed U.S.S. 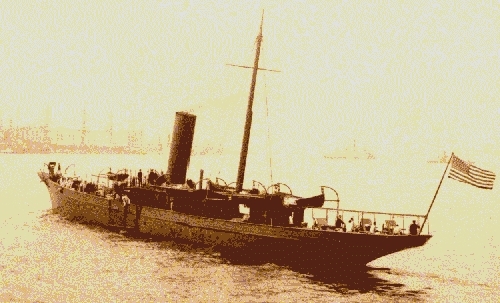 GLOUCESTER, armed with a light battery, and put into service as a gunboat with Sampson's squadron off Cuba. At the Battle of Santiago, she opened on the Spanish vessels as they attempted to escape Santiago Harbor. The main target for GLOUCESTER was the destroyers and she waited for them to exit. Wainwright considered it his duty to attack them before they could attack the US capital ships. As the Spanish destroyers appeared, Captain Taylor of U.S.S. INDIANA, which was pouring in a destructive fire on the vessels, sent out a signal stating "Torpedo boats coming out". Wainwright claimed he read the signal as "Gunboats close in", but this may have only been an excuse to cover the GLOUCESTER's apparent disregard of orders. The vessel attacked, crossing the batleship INDIANA's line of fire, and causing her to cease fire. The Spanish destroyer FUROR became the major target for GLOUCESTER. The Spanish vessel suffered a withering fire from the American vessel. FUROR's rudder jammed and she was unable to continue the fight. PLUTON, the other Spanish destroyer was blown up by other U.S. Navy vessels. At this point, GLOUCESTER changed her role, launching boats and rescuing 45 of the Spanish crewmen from these vessels. She then steamed to the burning hulks of the INFANTA MARIA TERESA and the ALMIRANTE OQUENDO and picked up more Spanish survivors. GLOUCESTER lost no men in the engagement. On July 25, 1898, U.S.S. GLOUCESTER attacked and captured the Spanish port of Guanica in Puerto Rico. On August 1, 1898, she and U.S.S. WASP took the port of Arroyo in Puerto Rico and held it until the army arrived a day later. After the war, GLOUCESTER steamed off the east coast of the U.S. until the Fall of 1898. At this time, she was sent to Annapolis for use as a schoolship, a position she maintained until 1902. Beginning on November 15, 1902, she served as tender for the Commander in Chief of the South Atlantic Squadron, in which role she steamed in the West Indies and off the coast of South America. The vessel was decommissioned on February 8, 1905 at Pensacola. After that date, she served with the New York and Massachusetts Naval Militias. On April 7, 1917, U.S.S. GLOUCESTER was recommissioned. She conducted harbor patrols around New York for the remainder of World War I. On August 12, 1919, she was struck from the Navy List amd was sold on November 21, 1919. U.S.S. GLOUCESTER was lightly armed and unarmored. Her usefullness in battle was somewhat limited, but she greatly exceeded expectations in this regard. Neafie & Levy, Philadelphia, PA.
Vertical triple-expansion engine, 2000 hp. 1 shaft. Clerk of the Joint Committee on Printing, The Abridgement of the Message from the President of the United States to the Two Houses of Congress., (Washington DC: Government Printing Office, 1899(. Holloway, A., Hero Tales of the American Soldier and Sailor. (Philadelphia: Elliott Publishing Co., 1899). Naval History Department, Department of the Navy, Dictionary of American Naval Fighting Ships. (Washington DC: Government Printing Office, 1959).